Richards Parish Walk Blog: 24th Mar 2011. It's a year today since I picked up the keys on the flat here at Ulverston, not really notable apart from the fact it was the day my Parish walk training started properly last year. I was a month in a hotel about 4 miles from Barrow, and walked into work and back, but as the Hotel was on the coast overlooking Morecambe bay and the road was coastal and flat it was just walking, not real training. I suppose we all have a fixed point in our minds when we are going to step up for real and get down to business, whether it's New Year, an anniversary or birthday, Easter (it's late this year, that's mucked your plans up!) or, one I've been hearing, the clocks going forward heralding springtime proper. I'm lucky because I kept a training diary for the University marking down all I ate, every training session, weight and other such things as heart rate and BMI amongst other things. I am up on last year, I was a little wary of the walk into work last year at this time, only twice a week and nothing afterwards. Now it's every day, with a 8.5 mile hill training session or a Cardio if I have time. Standing heart rate (a good indicator of heart strength) is down, Weight is similar but body fat is down, hours put in is much more, and I'm stretching properly which is something I didn't do at all. 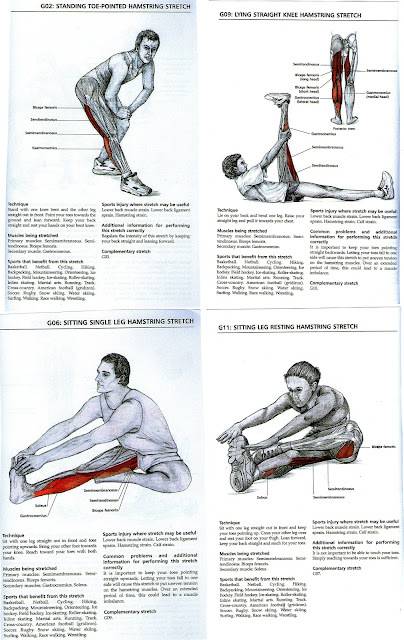 I thought I wasn't doing enough to warrant stretching, and didn't understand why it was necessary. I put all this down to lessons learned last year and the taking part in winter short distance races, picking up experience and speed. I have a coach who has helped me immensely understand the mechanics of race walking, and all this has kept a good underlying fitness, and has helped me walk at the same speed with less energy output. After walking back from work I now have something to eat, top up my fluids and look to get out again. Last year it was flop on the settee and let the aches settle. There are downsides. I'm more susceptible to injuries, although the stretching is helping to prevent this. I'm not sure how much certain training is helping, just out walking gradually is possibly helping very little so I might need other ways of training. And, my main problem last year, reaching a peak too early and then trying to maintain peak fitness for months at a time. Recovery and rest from training is vital for muscles to repair themselves. So, a good point to be at, especially as the warm days are here (for now?) and lots of people are out walking. I've dug out the shorts to get some sun to the pale winter legs and t-shirts instead of fleeces. I've eased right back in the last few days, with an important 20k race on Sunday. I've never dona a 20k before so a new experience. It's a slow build up, a few 10k's, a 10 mile, then 20k (12.2miles) and my coach hopes to find me a 50k to fit in with my training for the Parish and Roubaix 28. It's important to trail off the training before a race to allow the muscles to repair so plenty of protein. I also find that if I've not been out walking for a few days, toeing the start line sees me eager to get off, not wondering if those little niggles and aches are going to slow me down. A couple of things, answers to queries. Firstly, the food on the day. A study has seen that liquid food is more easily digestible, burns at a steadier rate, and less liable to upset the stomach. It was a study to try and find why people get tired at mid points in the afternoon at work, but we can take the results and use them ourselves. One group was given a healthy lunch of meat and vegetables, another group was given the same meal but it was blended to a fine soup. The second group fared much better as the food was easily digestible and mixed to such a point that there was a steady stream of all nutrients. Over time, they lost weight as fat wasn't absorbed in lumps, but all digested. No indigestion as chunks of fatty food weren't stuck to the stomach wall which gives us the "stitch" athletes hate, and the stomach didn't have to give bursts of acid to break down larger portions. I usually regulate my food during the walk, and a large flask of blended chicken and vegetable soup is in there. I can't eat solids after more than 3 or 4 hours as it feels uncomfortable. Blended liquid food is absorbed almost immediately, which, halfway up the sloc, is when you need it. Secondly, protein shakes during the race. There are different times during performance when you need different food and liquids. During say, a 10k walk lasting an hour, there are more than enough nutrients in the body that you need nothing at all. During a 2 hour race, or a good 2 hour training session, plain water is fine, and a very light healthy snack before is more than adequate. Over this, and sweat loss means you lose minerals and electrolites so I use ribena and a pinch of sea salt, and home made flapjacks, possibly a banana or glucose tablets. I also make sure I top up with green tea with ginger afterwards (a pint mug) and a healthy snack. But, on race day, if you expect to do 16 to 24 hours solid, then your body starts eating itself if you don't have a good healthy balanced diet. Shorter endurance races up to Marathon and possibly a little further, you need Carbs to burn, usually simple sugars which give an immediate hit. After a while though, you burn up your reserves of easily burning fat, certain amino acids and slow burning carbs, and the result is that you start breaking down muscle mass to burn as fuel. Research is being done all the time as these ultra distance races are relatively new and unknown, but a balanced diet including healthy omega fat and protein can help prevent muscle wastage, and keep nutrients travelling round the body and brain. It also helps the recovery of the damage done by 85 miles almost immediately. Research is still in it's infancy so if you know any different I would be grateful to hear from you. Also remember everyone is different. Some can't eat solids whilst walking, some can tuck into a greasy burger after 85 miles! So, what's best for you, and the main thing is, if its healthy, and you can keep it down, then eat it. Always try foods out first during training sessions, it's no good finding out that you're allergic to bananas whilst passing Jurby with only a car full of bananas for company. Vitally important for walkers as the hamstrings are one of the main muscles especially when climbing uphill. (Personally, before my walking days, I thought hamstrings were handed out to athletes when they got their athletes badge, and we mere mortals didn't have any, and I couldn't have pointed out a hamstring in a line up!). Good range of movement in the hamstrings gives speed and strength and help propel you up them there hills.